The School is a paranormal horror story about a middle-class couple who make a bad choice when choosing a new home. The central characters are Frank and Allison Hitchcock and their need for pastures new is fuelled by a desire to escape the beachside property where their son Joey lived and died. Unfortunately, when the Hitchcocks move into the old school on Ohio Road, they find they have more than memories to haunt them. However, Allison starts to believe the unusual atmosphere present in the building may be able to reunite them with their son. The school has thirty-five rooms plus administrative offices, a nurse’s station, a gym, and much more besides. It is a big place and the Hitchcocks got it for the bargain price of just $75, 000. The price may have been right but the old school is still a large place for two people to rattle around in and, although Frank and Allison tell themselves that they bought the school out of a feeling of nostalgia, deep down inside they are not so sure. 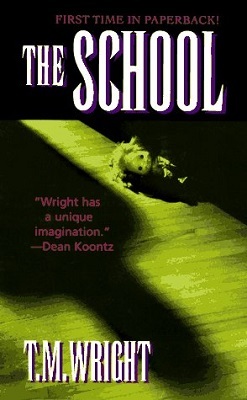 The reader can only presume that something inside the school influenced the Hitchcock’s decision and somehow compelled them to buy the place, but this is something that is never adequately explained. A school is an odd choice for accommodation and even a corridor that is illuminated by a row of Mickey Mouse nightlights (Frank’s idea), though quaint, is never going to make it homely. But if home is just a place to hang your hat the Hitchcocks have plenty of hooks to choose from in the cloakrooms, and Frank and Allison do their best to make themselves feel at home in the school, even if it does prove to have a shady history and a few ghosts wandering around the corridors. The Hitchcocks are reasonably likeable characters and I am sure that a lot of readers might feel sympathetic towards their loss, but I found the whole dead son thing a little tedious and surplus to the plot. It makes sense that losing their son could prove to be an influencing factor in their decision to move home and that he would still be on their minds but, all too often, I felt like the character of poor, dead Joey was being forced into scenes that would have been better without his almost presence. I say ‘almost presence’ because he never materializes into anything more than a memory or a dream. A real ghost-Joey would have been interesting, but this almost presence was present far too often for my tastes. The School has some creepy scenes and there are also some enjoyably surreal moments, but overall I found little to make the story stand out from the many other books that have been written about haunted houses, other than the fact that the house in question was a former school. All in all, on a scale of one to ten, I would rate this story as a six because I feel that a lot of things in the story could have been expanded upon and better explained.